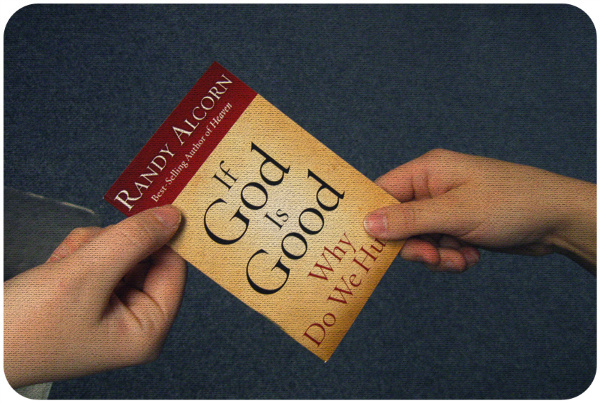 One of the things I often do is give away books and booklets to people I meet. Wonderful things have happened over the years because of this simple act, and I’ve come to see books and literature as “seeds” we can sow to share the good news about Jesus. Not all of them will grow and bear fruit, but some of them will. Ever seen grass grow through asphalt? It’s amazing if you think about it. How does grass, pressed flat and robbed of light, persevere? Yet we’ve seen it. Somehow God made those tiny blades of grass to rise to the greatest challenge. If a plant can grow through asphalt, God can use anything—including a book—to break through the darkness of someone’s life! I think of Jesus’ parable of the sower (Mark 4:1-20). When we “sow” books, we don’t know which people are “good” ground ready to accept the seed, and which people are “bad” ground, who ultimately won’t respond to the Gospel. But look at what happens when the seed does find fertile ground: “And other seeds fell into good soil and produced grain, growing up and increasing and yielding thirtyfold and sixtyfold and a hundredfold” (Mark 4:8). Nanci and I were at a dog show a few weekends ago, and my coat pocket full of booklets was nearly empty by the time we left. Every time I had a nice conversation with someone (including two shuttle bus drivers), usually about dogs, it was a natural thing to give them a booklet. Will some of those booklets be tossed without being read? Probably. But some will be read, whether immediately or three years from now. Who knows what God may do through His Spirit and His Word in those lives? George is right—anyone can give away a book. It can be as simple as leaving one (along with a generous tip!) for a waitress or waiter who serves you, leaving a book at a doctor’s waiting room, or just keeping a copy on you to give when God provides an opportunity. We'll never hear in this life the majority of the many stories resulting from this simple act, but I believe in God's kingdom we'll hear every one of them. Sometimes we do get a glimpse into how God has worked. One such story that comes to mind is when I met an Iranian college student on an airplane and gave him my novel Deadline. I found out years later that the same night after checking into his dorm, he stayed up all night reading it. When a character came to faith through reading Mere Christianity, this young man got on his knees and gave his life to Christ. Someone told me he’s become the godliest man she knows. While I was fiddling with the car, a woman and her 13-year-old son were getting into their car in the space by us. Nanci and she chatted and I asked if I could give a book to her son. She said, "Yeah, he loves to read." When he saw it was a graphic novel, his eyes lit up. I told him the artist has worked on Wolverine and Ghost Rider. He was thrilled to receive it and said, "I want to be a writer!" We had a great chat about writing. Five minutes later our car was running. Quentin was reading as they drove away, and I'm confident he read Eternity, and saw and heard the good news of Jesus. Ten minutes earlier or later on the timing, and I would never have met them or given Quentin the book. I just LOVE those divine appointments, where God's plans are far better than ours! Many of life’s inconveniences involve divine appointments if only we open our eyes to see them. So I encourage you to see your life as full of divine appointments, and to look for opportunities to give books and booklets to the people you meet. Pray for them, and look forward to reaping a harvest and one day seeing what God has done in someone's life because of it! And let us not grow weary of doing good, for in due season we will reap, if we do not give up (Galatians 6:9). I’ve been encouraged to pray, even if briefly, for many people I see in passing and don’t know. This I do know—God created them, loves them, and desires them to be saved and to come to a knowledge of the truth (1 Timothy 2:4).